THE SIX AREAS OF PLANNING. Our process involves several steps to establish a fully shared understanding of your current financial situation as a foundation for longer term strategies tied to your goals and objectives. Our first priority is a comprehensive assessment of your current financial position. We review available income and other resources, ongoing expenses, assets and liabilities. Our journey must start with a realistic view of where you stand today. Next we want to understand your key goals, and objectives, and what might short circuit your ability to achieve them. At this stage we want to focus on risk management; what protections we might put in place to prepare for the possibility of premature death or disability. 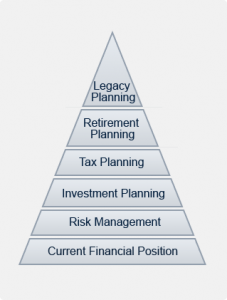 Then we can turn to investment planning with a firm grip on current income and expenses and life-event risk factors. Our investment strategies place a premium on broad diversification, ongoing flexibility, and cost-effectiveness. Ours is not a “shoot-the-lights-out” strategy; rather we strive to build a portfolio with real potential for long-term growth while observing your realistic tolerance for periodic market volatility. Tax planning and periodic changes in tax laws play a role in positioning your investments and, in some cases, how and when you elect to receive income. Flexibility and continuous review of tax implications is critical for those with wide variability in their income over time and/or unusually high earnings for a limited period of years. Retirement planning is a special challenge for highly affluent households. At whatever point you step away from a demanding professional career, you’ll want to maintain the quality of life you’ve built and perhaps embark on new adventures with your leisure time. This requires the accumulation of a significant asset base and effective income generating strategies. Legacy planning is a highly personalized, integrated process to define and structure the lasting impact that your financial success and stewardship might have on your heirs as well as charities that hold special meaning for you.